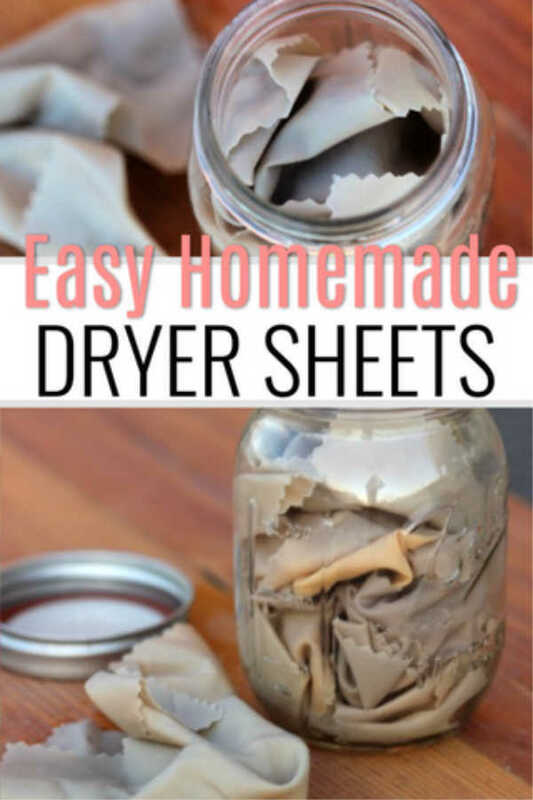 It is so easy to make Homemade Dryer Sheets. Save a ton of money and learn how to make DIY Dryer Sheets at home. I started making my homemade laundry detergent a couple of years ago and I still love it. I have been wanting to make homemade dryer sheets, and I don’t know why I haven’t… until now. When I finally sat down to see what it would take to make my own dryer sheets it took me all of 2 minutes. Homemade dryer sheets are so crazy easy to make and I’m kicking myself for not making these sooner. They are easy to make and budget friendly. Plus, they smell amazing and work really great. It is a win all around. Even my family has commented on how fresh their clothes smell and how soft they are. I love that I can give my family good quality items while also saving our household money! All Natural Dryer Sheets are so simple! We are trying to make more and more of our own products. This is a great one to try if you are just getting started. It is a simple project and only takes a few minutes. It is so easy that even the kids can help. Truly anyone can make these easy DIY Dryer Sheets! Plus, you will love knowing exactly what is in the dryer sheets you are using. You won’t find any complicated or hard to say ingredients. You can feel good about using these on your families clothes. Let’s get started making Homemade dryer sheets! You only need a handful of materials to make your own dryer sheets. I am confident you have what you need on hand right now, so why not make them with me? 1. Cut your pillowcase into several rectangles with your pinking shears. My rectangles were about 6″ x 4″, but as you can tell I wasn’t picky about them all being the same. I used a king size pillowcase and only cut up about a quarter of it. I only ended up needing about a dozen pieces in my jar so I had plenty. 2. Like I mentioned, I stuffed about a dozen pillowcase pieces in my mason jar. In a measuring cup I mixed together 1/4 cup vinegar and 3 drops of Citrus Fresh essential oil. I was using a pint sized Ball jar, so 1/4 cup vinegar was plenty. The essential oil is completely optional but it makes it smell so good. Citrus Fresh is one of my favorite scents so that is why I chose it. Learn how to use essential oils here. 3. 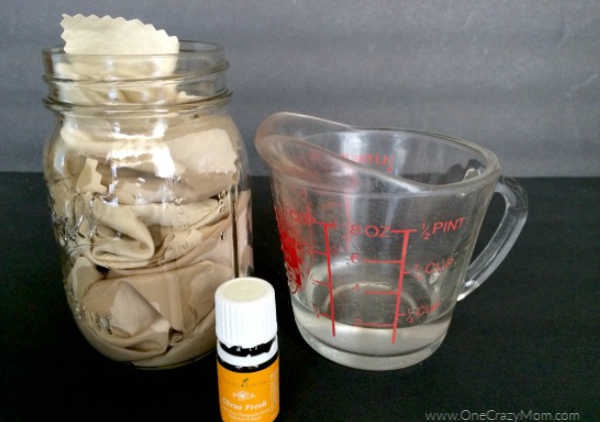 Once your liquids are mixed, pour it over your fabric pieces in the jar. Secure the lid on your jar and shake it up. Make sure all of your fabric pieces are well saturated. It is so easy to make DIY Dryer Sheets! Note: I used a king size pillowcase but any size or similar fabric will do. Just use what you have on hand. No need to buy anything special for DIY Dryer Sheets. They will work great! 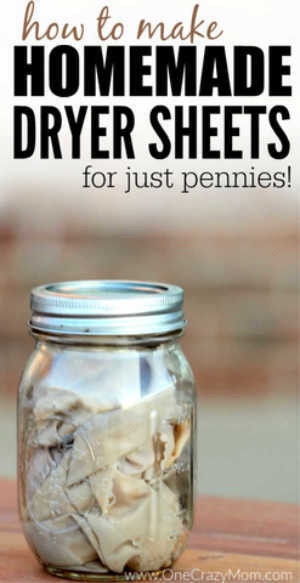 Now you know how to make homemade dryer sheets! 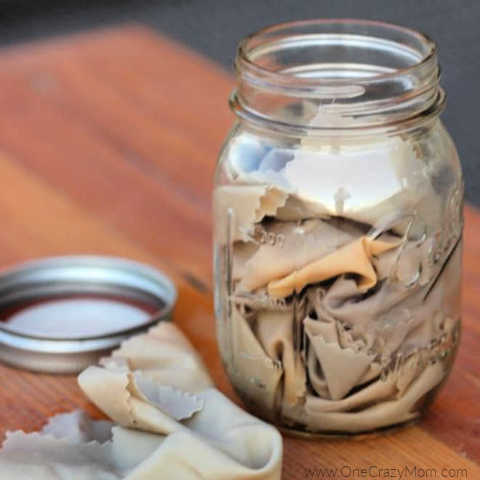 You will love using this natural fabric softener. 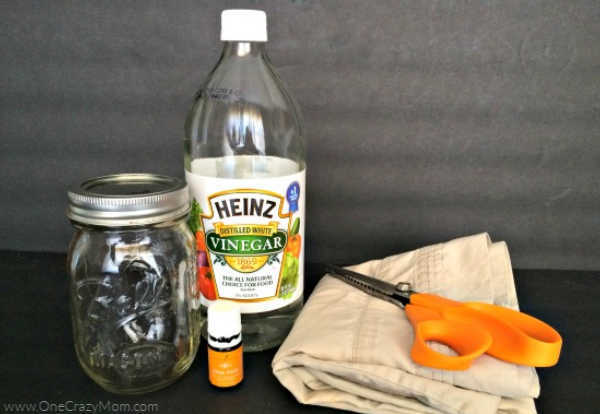 White vinegar is so versatile and it is great for laundry and more. 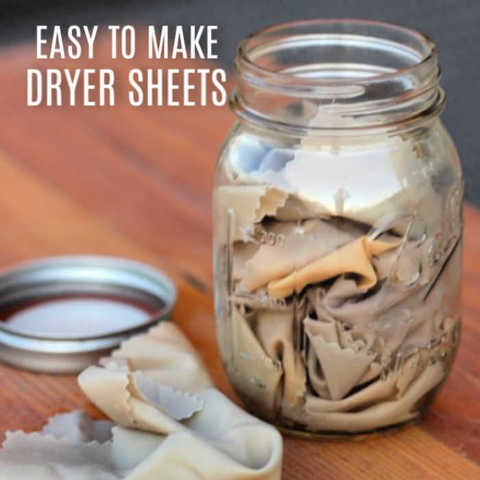 Now you will not need to purchase store bought dry sheets because you can make your own at home. This is also eco friendly and saves money. Not only are you saving money but you are helping the environment with each load of laundry. 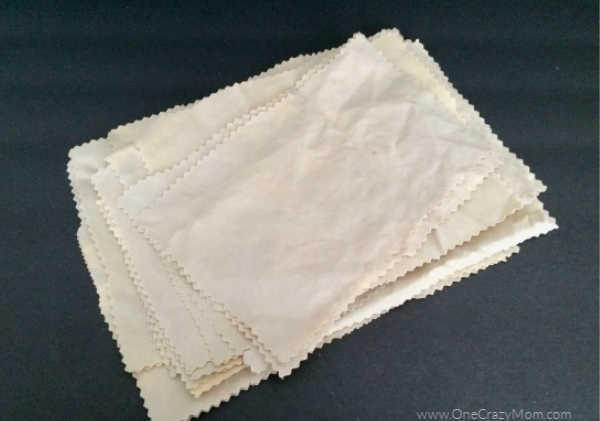 Homemade dryer sheets work great, won’t smell and leave your clothes free of static cling. Next time you dry your clothes, try using your homemade dryer sheets. I think you are going to love them and never go back to store bought dryer sheets again! You can also try liquid fabric softeners or homemade fabric softener with hair conditioner and baking soda in your laundry on the rinse cycle. We have even used wool dryer balls. That’s it! 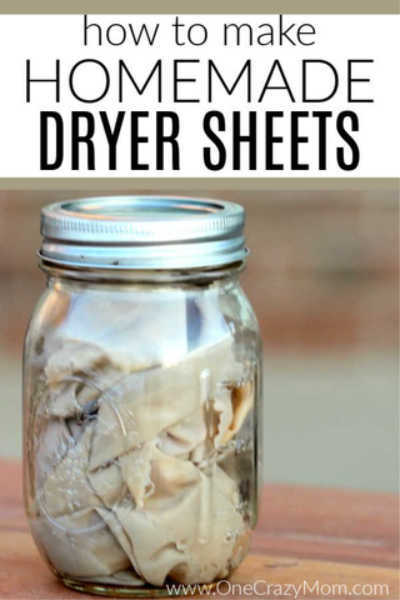 I told you making your own homemade dryer sheets was crazy easy. I just throw one of these in the dryer like I would with a typical dryer sheet. Once the clothes are dry, I put the fabric piece aside. When I am done doing all of my laundry, I put the fabric pieces back in my jar to use for next time. 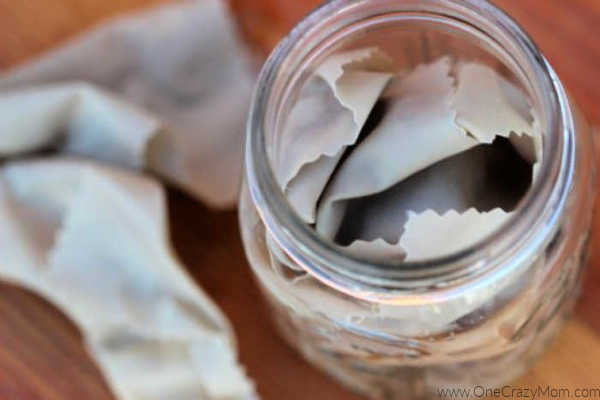 When I notice my jar is drying out, I just add more vinegar mixture and the homemade dryer sheets are ready to use again. Do you make your own fabric softener dryer sheets? I would love to hear what you think of them. Get started making natural products today! You are going to love having so many natural products to grab in your cabinet! Once you start making your own Homemade dryer sheets, you will want to try making even more things at home! It is so nice saving money and being able to give your family really good items to you. You don’t have to wonder what chemical or crazy ingredients are being included. You won’t find any of that in these natural products that can very easily be made at home. It is a win for the entire family as they get to benefit from natural ideas and products plus you save money!